The apartment has a lot of natural light and is very comfortable. There is a bright living room where you can sit down, relax and watch television. The kitchen is fully equipped and is a great area to cook and enjoy delicious meals. Both bedrooms are accommodated with a comfortable and big queen sized bed where you really get to rest after a long day of walking in Paris. The two bathrooms are nice and you can take a relaxing shower there. It is a great apartment and I am sure you will enjoy it! It is located just next to Notre Dame, Sorbonne, Saint Germain and Saint Michel and Saint Germain; you are in the very historical center of Paris. 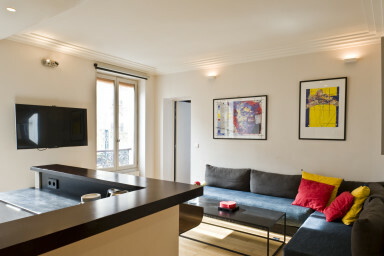 This flat is really convenient if you want to visit Paris, you will be really in the middle of every main places to see, walking and leaving in the heart of the city next to main Shopping streets of Paris, and in a typical Parisian style flat you will feel like a real Parisian. All bars, restaurants, shops within 2 minutes around, location is really convenient to go to eat or have a drink, area is safe and always animated at night. It will be a pleasure to welcome you at 33 rue du Louvre, 75002 Paris.